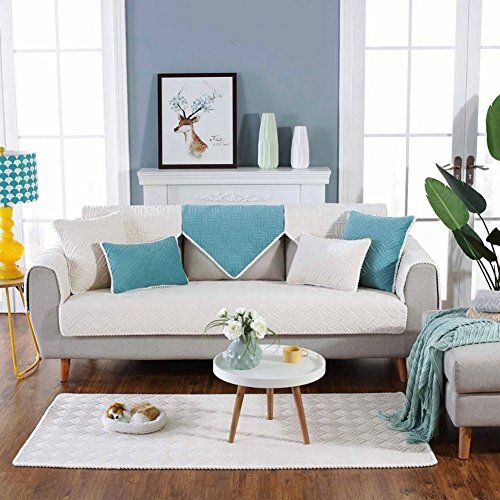 KKONION Solid Warm Plush Sofa Covers for Home Living Room Decorative Slip Resistant Sofa Slipcover Seat Combination Couch Cover by KKONION at Home Decor Outlet Store. MPN: XLL-AAA-4161. Hurry! Limited time offer. Offer valid only while supplies last. Attention!!! Please be aware of REPLICA. KKONION never authorize to any other seller. Please check carefully before checking out. Solid Warm Plush Sofa Covers for Home Living Room Decorative Slip Resistant Sofa Slipcover Seat Combination Couch Cover. It can not only be used as a protective cover for the sofa, which is anti-fouling and breakage-proof, able to protect sofa, but also used as a pet sofa mat to prevent the pet from scratching the sofa.Soft and breathable, provides a comfortable feeling.Stretchable material, perfectly fits for most sofa. This basic slipcover shields and protects your furniture from spills, stains, wear and tear to prevent it from getting ruined. It's great for homes with children and pets, or for anyone seeking an economical solution for furniture protection. Can not afford the ball, more durable, no static, no dirt. This sofa cushion has a certain thickness, has a short plush, and is comfortable to touch. If you have any questions about this product by KKONION, contact us by completing and submitting the form below. If you are looking for a specif part number, please include it with your message.